Khaled Sabsabi, Guerrilla (detail), 2007 – 2017, hand painted acrylic on photographic paper. Image courtesy of the artist and Milani Gallery Brisbane. AGNSW Collection. Its bringing down was, perversely, a sign of defeat. When Islamic State militants toppled the leaning Al-Hadba minaret and levelled the Great al-Nuri mosque in the city of Mosul in June, this event marked the imminent collapse of the ISIS caliphate in Iraq. And yet, as images of this landmark monument’s destruction were circulated by media around the world, the link between demolition, war and trauma became all too clear. More than merely symbolic of the wounds that armed conflict inflicts on innocent people, photographs of war ruins like those of the Mosul Old City arrest and imprint themselves on the minds of viewers with strangely lasting effect. In years to come, when the stories of human suffering and civilian casualties in Iraq are subsumed by the news cycles of equally bloody wars elsewhere, why is it that the image of the city in ruins will continue to haunt our collective memories of the battle for Mosul? This astute distinction that Said Makdisi draws between the affective force of ancient compared with modern ruins suggests that images of demolition, as opposed to decay, perform a very specific kind of memory work. In Remembering, Repeating and Working-Through, Freud argues that ‘repetition is a transference of the forgotten past.’ To what extent is photographic evidence of demolished architecture similarly bound to traumatic memories structured by repression and repetition? Brought about by overwhelming events that evade the psyche’s usual defenses, trauma is, by its nature, enigmatic and unassimilable. Yet by engaging demolition as a conduit to ‘the forgotten past,’ this article explores how the work of a number of contemporary artists raises timely questions about the role an active form of remembering can play in countering the amnesiac cycles of trauma that history all too readily repeats. Recently presented at the Art Gallery of New South Wales for The National earlier this year is a series of 33 framed overpainted photographs by Tripoli born, Australian-Lebanese artist, Khaled Sabasbi, titled Guerrilla (2007-2017), that take images of demolished architecture as a starting point for testing the limits of trauma’s malleability. Having taken the photographs in the aftermath of the 2006 Israel-Hezbollah war in Lebanon, a brief but intense conflict that pitted heavy aerial bombardment against an on-the ground guerilla campaign resulting in the widespread destruction of Beirut, initially Sabsabi did not conceive of the snapshots as works of art. Yet, over time, he returned to the images and started overpainting them, a gesture triggered perhaps by the artist’s need to work through the unassimilated trauma of his earlier encounter with war. As he intimately and meticulously worked and reworked the images by hand, Sabsabi was ‘able to materially smudge the 2006 Lebanese conflict,’ (2) the artist has said. Following Fassl’s account of trauma and perception, the hyper detailed overpainting of demolished streetscapes in Sabsabi’s Guerrilla thus can be understood not as an attempt to represent trauma but, rather, as a symptom of the extreme ‘emotional arousal’ that trauma provokes and the need to master traumatic memory by bringing it to the level of consciousness. Just as the destruction wrought on Beirut by the Israel-Hezbollah war is largely recalled in images of rubble and ruination, in its recent reporting of events in Mosul the western media reveals a similar preoccupation with footage of destroyed architecture. This cannot help but bring to mind the latent presence of an earlier fall: the toppling of the twin towers of the World Trade Centre in 2001. Arguably the primal scene of contemporary collective trauma, the image of the collapsing towers is seared as a reality imprint on the mind of the West. Is it not possible, though, that our photographic recall of 9/11, contrary to functioning as a memory aid to the assimilation of its trauma is, rather, the sign of our very failure to remember; the proof of trauma as normality in the modern world? The body of work titled Scheduled Implosions (2016), by US artist Hannah Smith Allen, points to the amnesiac repetition underlying the cycles of violence and destruction that have become a hallmark of modernity. Here, Smith Allen rephotographs media coverage of building demolitions found on the internet, shooting still images with long exposures that arrest and repeat the moment of the building’s collapse in a kind of sublime slow motion. Focused on planned demolitions rather than acts of terrorism, the series contains no images of the World Trade Centre. Yet in her ghostly re-mediations of scheduled building implosions in Houston, Texas; Flint, Michigan; Las Vegas, Nevada; and other cities across the US, its spectral presence is both everywhere and nowhere apparent. Faced with images of dust clouds and scenes of air-borne debris, the specificity of location becomes irrelevant. Spectators slavishly hold up their mobile phones to snap pictures as the drama of destruction compels and fascinates. Hannah Smith Allen, Scheduled Implosion (Spectators 1, Governor’s Island, New York). Courtesy the artist. Hannah Smith Allen, Scheduled Implosion 1 (Governor's Island, New York), 2016. Courtesy the artist. While the underlying causes of the destruction wrought upon the physical fabric of the cities of Mosul, Beirut and New York differ markedly, each city has nonetheless undergone processes of rebuilding that reflect complex tensions over how communities and nations deal with, and commemorate, historical trauma. Such tensions are explored in the near decade long Wonder Beirut Project (1997-2006) by Lebanese artists Joana Hadjithomas and Khalil Joreige, which revolves around the story of a photographer, Abdallah Farah, purportedly commissioned to document pre-civil war Beirut in nostalgic picture postcards idealising the city as a glamorous Mediterranean of the Middle East. Distraught by the onset of war, Farah began to burn his negatives in secret at night. The charred negatives lay dormant until they were discovered and subsequently printed by Hadjithomas and Joreige in the 1990s. Or so the story goes. While such nostalgic postcards of Beirut did, and indeed still do exist, Abdallah Farah is a fictional creation of the artists. 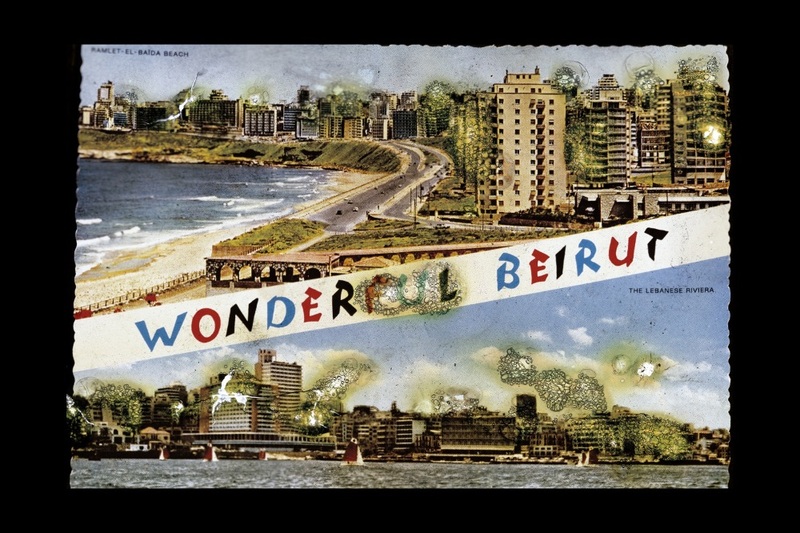 The altered postcards, and the para-fictional story surrounding their traumatic compulsive deconstruction, is a deliberate response on the part of the artists to contest the uncritical reception of the contemporary rebuilding of Beirut. Arresting the viewer with a dazzling retinal burn, the images of Wonder Beirut unsettle in their heady mix of intense colour saturation, typical of tourist postcards, with the violent luminosity of fire and explosions associated with armed conflict. As marks of trauma, the repetitive infliction of burns and scratches on the surface of these idyllic scenes again invoke the heightened ‘emotional arousal’ of war, which resists assimilation into ordinary memory and experience. Joana Hadjithomas and Khalil Joreige, The Story of a Pyromaniac Photographer, ‘Wonder Beirut’ Project (Part 1), 1997–2006. Diasec # 1, photographic print with face mounting, 105 x 70 cm. Courtesy the artists and The Third Line, Dubai. As global war continues to produce an ever-growing proliferation of images of demolition, we are similarly tasked with forging new contexts and situations for their reception. The question is, will engaging in our own forms of critical memory-work be enough to negate the forgetfulness of disaster? In an age of destruction as spectacle, the challenge to transform unthinking repetition in the encounter with trauma into the lived experience of meaningful remembrance has, indeed, never been greater. Jean Said Makdisi, Beirut Fragments: A War Memoir (New York: Persea Books), 1999, pp.211-12. Khaled Sabsabi, interview with Kon Gouriotis in Artist Profile, issue 33, 2016. Johanna Fassl, ‘“We Photograph Things to Drive Them Out of Our Minds”: War, Vision and the Decoding of Memory in the Photography of Iraq Veteran Russell Chapman,’ intervalla, volume 2, 2014, p.129. Eric Rosenberg, ‘Walker Evans’s Depression and the Trauma of Photography,’ in Trauma and Visuality in Modernity, eds. Saltzman and Rosenberg, 28-47 (Hanover: University Press New England), 2006, p. 45. Maurice Blanchot, The Writing of the Disaster, trans. Ann Smock (Lincoln: University of Nebraska Press), 1988, p.3. Ulrich Baer, Spectral Evidence: The Photography of Trauma (Cambridge: MIT Press), 2002, p. 182. Joana Hadjithomas and Khalil Joreige, ‘On Being Contemporary – Re-activating the Present: in conversation with Nat Muller,’ Art Papers, 2013. Ella Mudie is a Sydney-based arts writer with broad interests across the visual arts, literature, architecture and design. She recently received her PhD from the University of New South Wales, Sydney.